Pharmatech LLC is a, full service laboratory and contract manufacturer. Our staffs of chemists, project managers, engineers, contract manufacturing technicians and administrative personnel are dedicated to meeting our client’s needs. Our diverse educational background and experience provide Pharmatech LLC with comprehensive skills that a committed laboratory and manufacturing facility requires. “We pride ourselves in meeting and exceeding client expectations and providing superior customer service”. 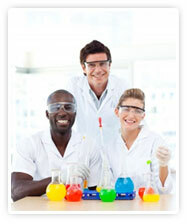 We primarily serve industries that required cGMP laboratory testing such as ours. Our knowledge of the industry, effective testing & analysis, competitive pricing and capabilities are what makes us a preferred choice. Pharmatech LLC pays close attention to detail assuring that all testing and analysis performed are in compliance with FDA and DEA standards. Our average turn-around for routine testing is 7 to 10 business days. Pre-approval is required for rush services, which can be provided at an additional charge. Certificates of analysis are neatly arranged, promptly generated and contain results as well as all pertinent sample information. To receive more information, request a quote or determine turn-around time specific to your product, please call (954) 583-8778 or Email us for a prompt response.